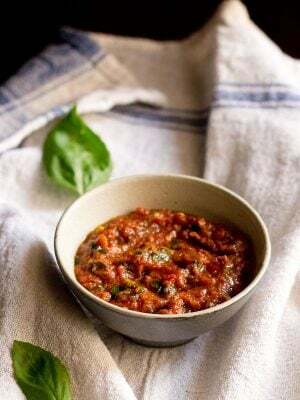 italian herb bread made from a combo of whole wheat flour, all purpose flour and olive oil and the herbs used for making bread are fresh basil, fresh parsley and dry rosemary along with sun dried tomatoes. herb bread recipe with step by step photos – this is an italian recipe of an easy, simple and a no fuss herb bread made from a combo of whole wheat flour, all purpose flour and olive oil. the herbs which i have added to the bread are fresh basil, fresh parsley and dry rosemary along with sun dried tomatoes. 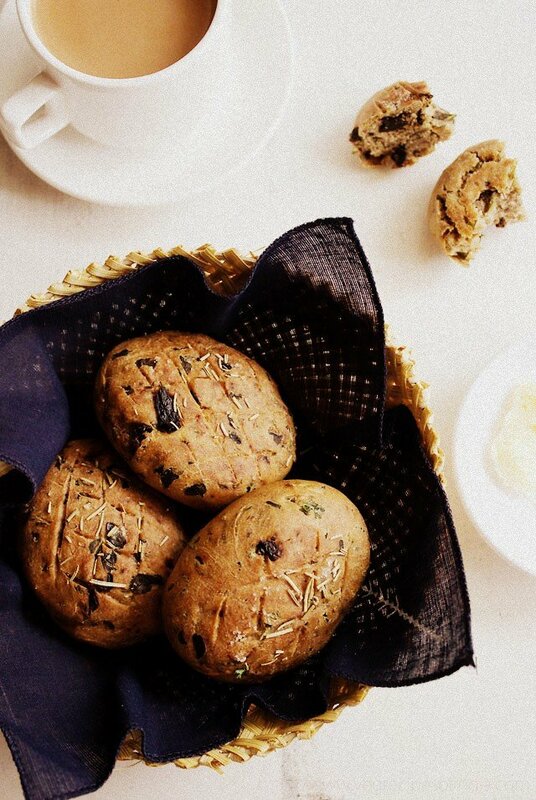 the result is a chewy, dense and aromatic bread flavored with the herbs and sun dried tomatoes. if you make the bread totally with all purpose flour/maida, then the bread won’t be chewy and dense. i kneaded the dough in the afternoon and by the time the bread was leavening & when i had to bake it…. it was night. so the baking pics have been shot in night time. once the baked bread was cooled down, i warmly snugged these in a kitchen napkin and kept in the fridge. for our morning breakfast, i warmed the breads with the morning ginger tea. 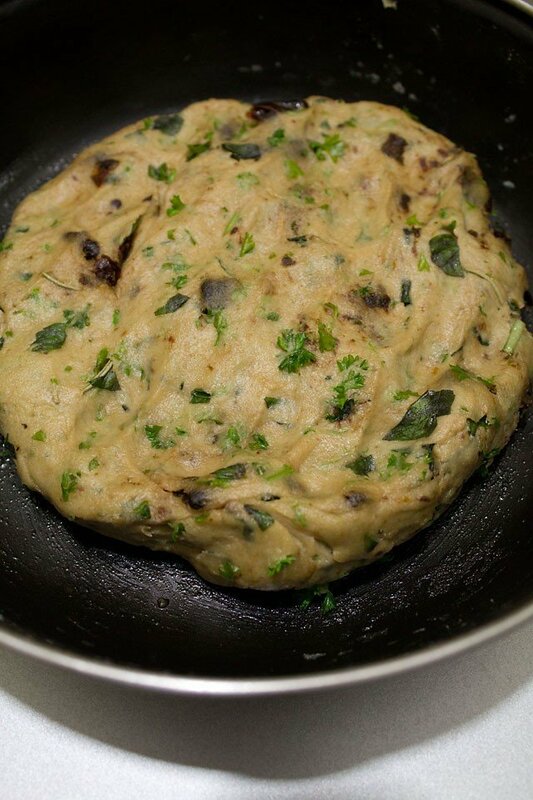 this herb bread recipe is eggless as well as dairy free. 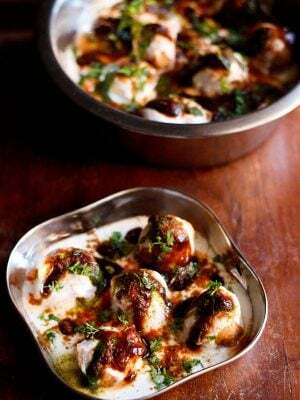 i have adapted this recipe from the cook book “vegetarian mediterranean cooking” by beverley jollands. 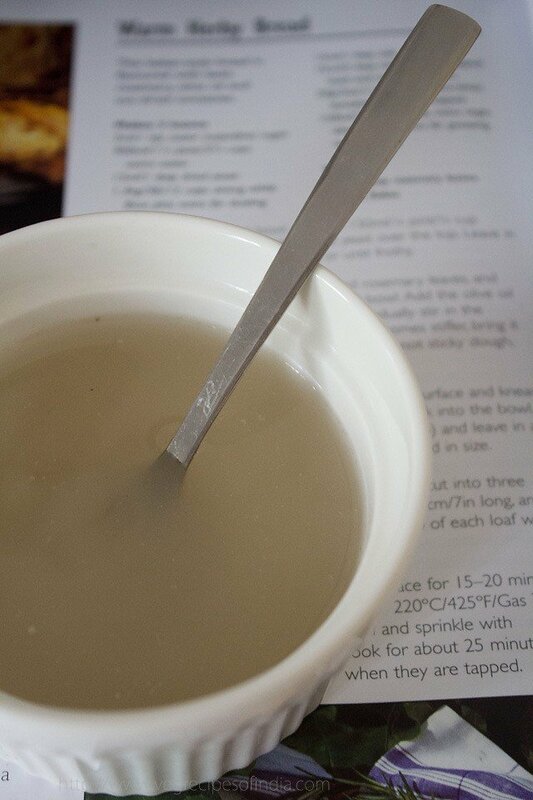 proof the yeast by adding it to the 1/2 cup warm water & sugar mixture. keep in a warm place for 10 to 12 minutes, till the mixture bubbles. mix the chopped herbs, sundried tomatoes, olive oil and salt together. now add the yeast mixture and continue to mix. add some 1 or 2 tbsp water if required to bind the dough. 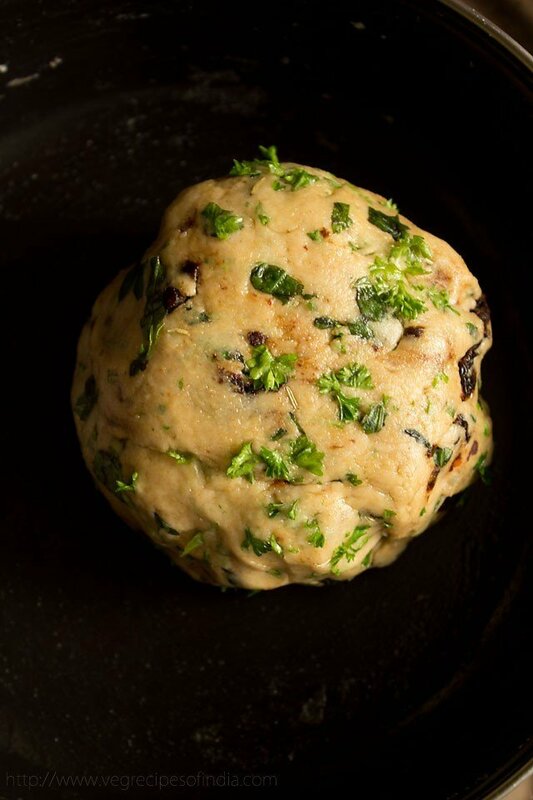 knead into a smooth and pliable dough. the dough should not be sticky. rub olive oil all over the dough and keep it covered in a bowl for 30-40 minutes or for more time, till it doubles in size. knead again until smooth and elastic. make round or oval shapes of the dough and arrange them on an oiled sheet. slightly make a criss cross pattern on the top of each loaf with a knife. 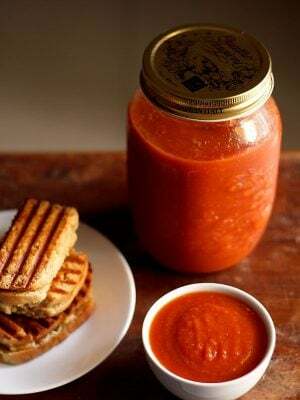 cover loosely with a lid or kitchen towel and keep again in a warm place for 15-20 minutes or until well risen. 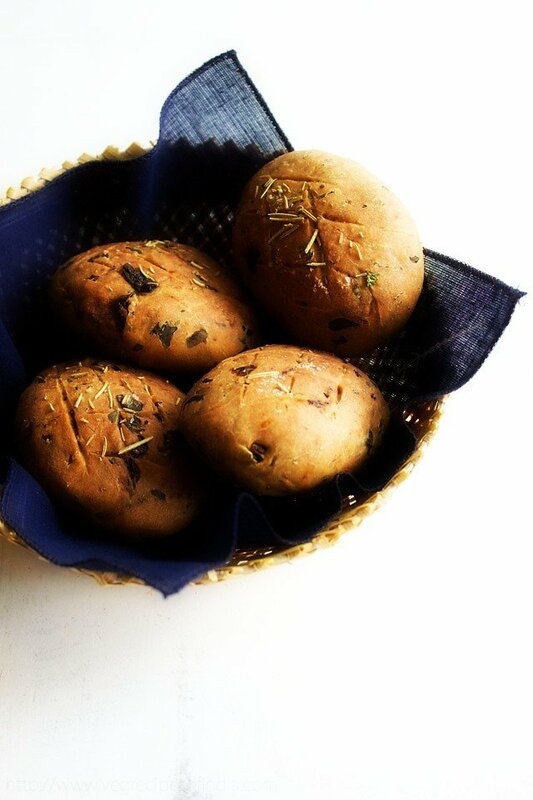 brush the bread buns with little olive oil, sprinkle some rosemary leaves and salt. bake in the oven for about 20 to 25 minutes. the base should sound hollow when they are tapped. 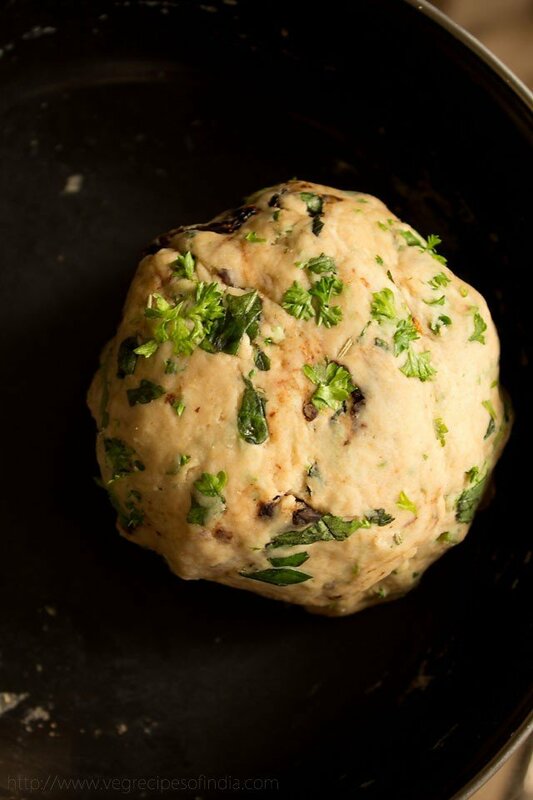 serve italian herb bread warm. 1: the proofing needs to be done first. mix the sugar with warm water. add the dry yeast to this mixture. 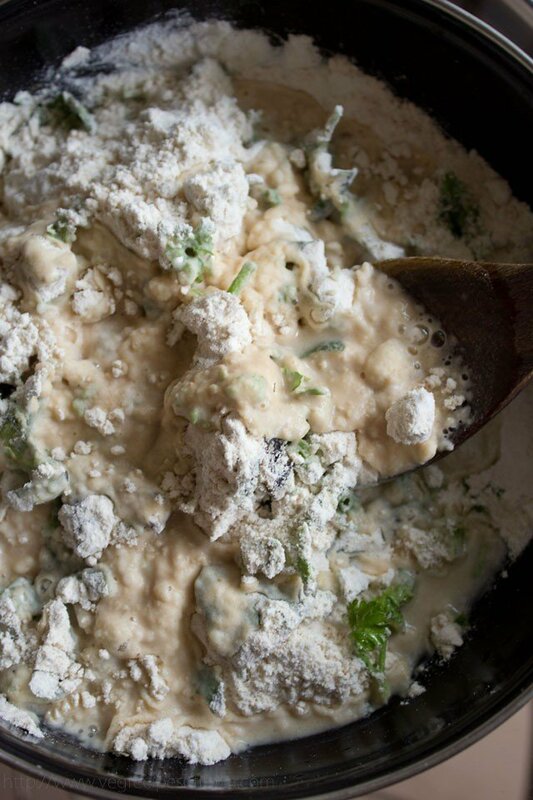 stir and leave in a warm place for the 10 to 12 minutes or till the mixture becomes frothy. 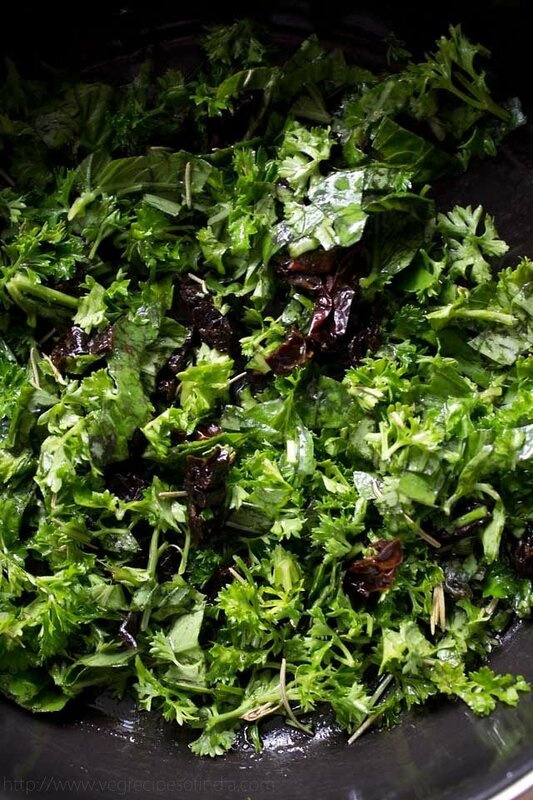 2: mix the chopped fresh herbs, dry rosemary, sun dried tomatoes, salt and olive oil in a large mixing bowl. 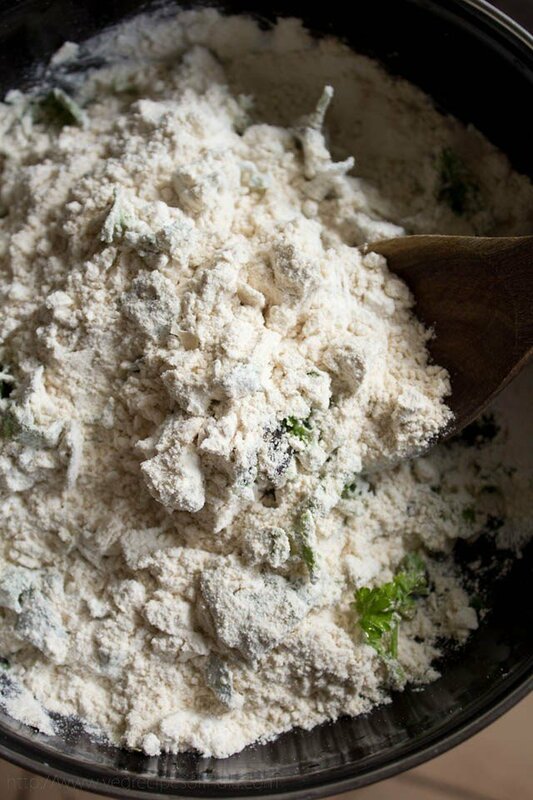 3: add both the flours to this and mix together. 4: now add the yeast mixture and mix everything together. 5: add some warm water if required and knead into a smooth dough on a lightly floured surface. the dough should not be sticky. 6: put the dough back into the same bowl. apply olive oil over the dough. 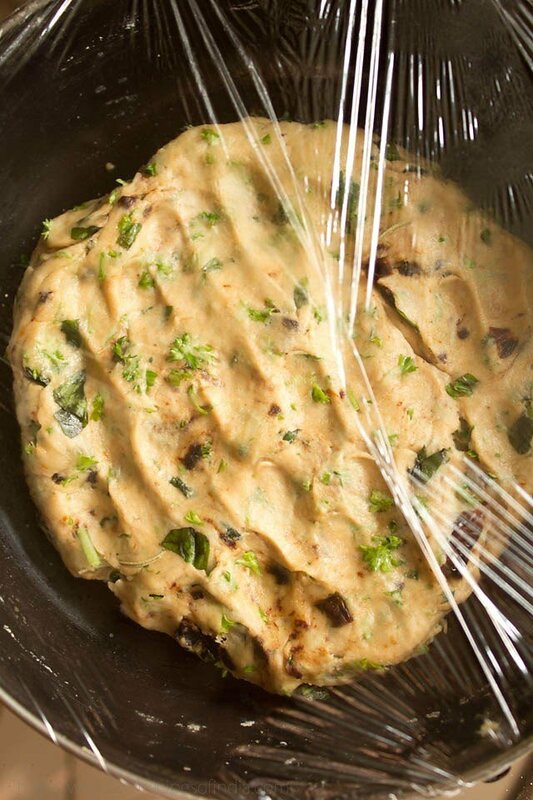 7: cover with a cling film and leave in a warm place for 30-40 minutes or until the dough becomes double in size. 9: knead again until smooth and elastic. make round or oval shapes of the dough and arrange them on an oiled sheet. slightly make a criss cross pattern on the top of each loaf with a knife. 10: cover loosely with a lid and keep again in a warm place for 15-20 minutes or until well risen. preheat the oven to 200 degrees celsius. 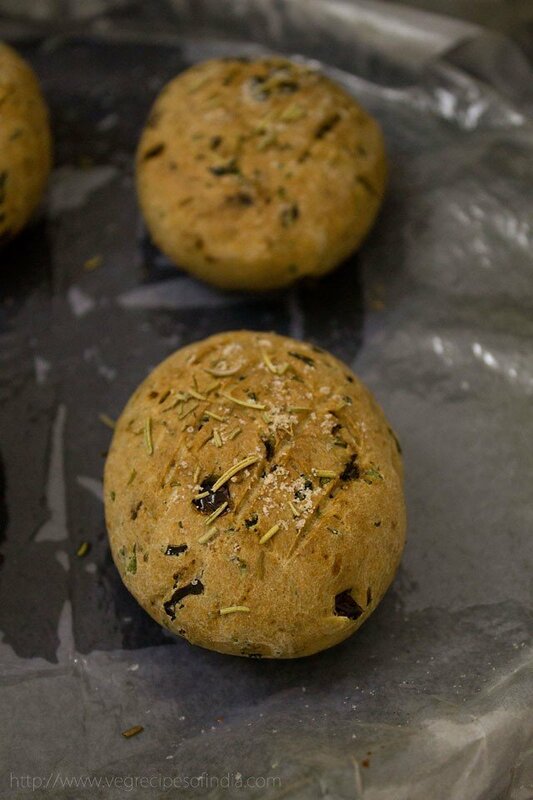 brush the bread buns with little olive oil, sprinkle some rosemary leaves and salt. bake in the oven for about 20 to 25 minutes. the base should sound hollow when they are tapped. 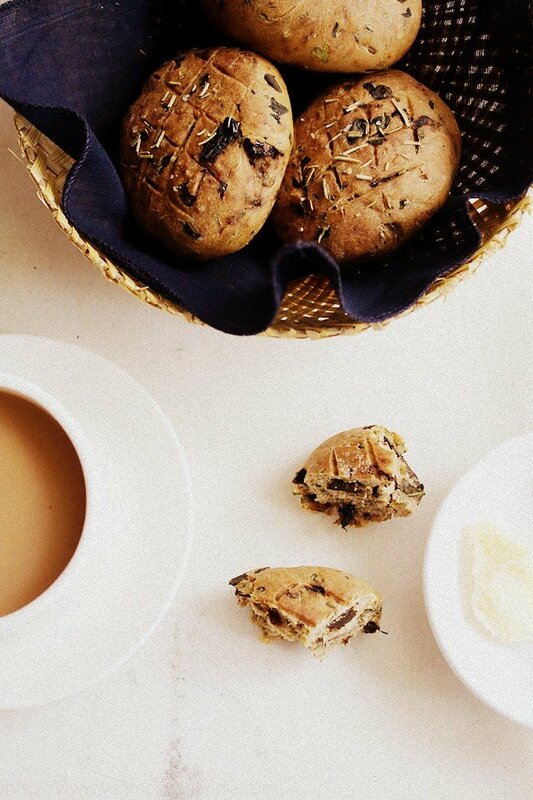 serve italian herb bread warm with masala chai or filter coffee or badam milk. I tried the bread. It came out a little dry. With the soup it seemed fine but otherwise not that great. Where do you think I went wrong. I love all your recipes. You are doing a great job. 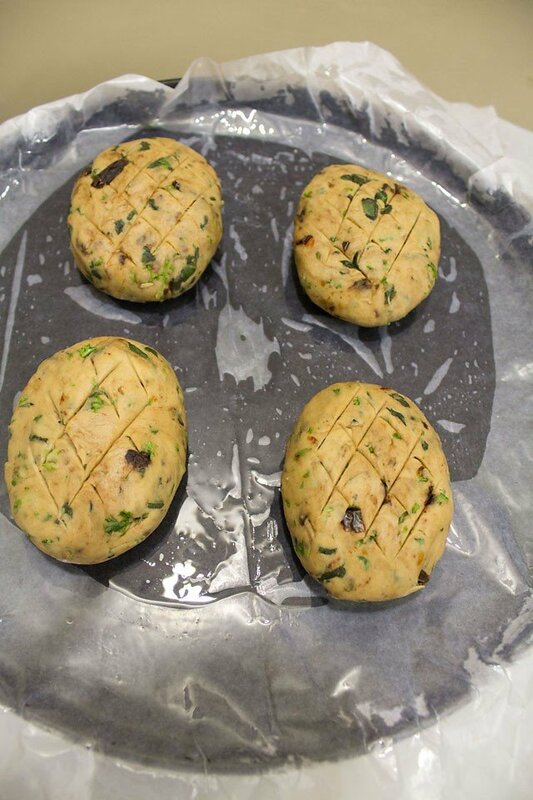 charu, dryness could be due to less water content in the dough, less kneading or over baking. so it can be any of these reasons. usually a bread dough is soft and supple. so if the dough does not feel soft and pliable, then you can always add some more water. also knead the dough very well. I’m a huge fan of your recipes. I have not tried baking before . I want to try and learn baking. You have mentioned that you use an otg. Can you please help me select the best suited otg for a beginner? Keep posting many more interesting recipes! Thanks Hanisha for your kind words. I don’t know which is the best OTG. I am using bajaj 35 litre oven and it is a slightly bigger model. its a good one. you can go for a smaller size oven. for brand you can check online reviews or ask the sales person in the shop. when i wanted to buy the oven, then apart from bajaj i was thinking of buying morphy richards oven. but didn’t buy it as it was big for my requirement. Today I tried making Italian herb bread. The taste was very good. I baked in the middle shelf in optima OTG , but still the bottom of the bun got burnt. I covered with aluminium foil both the bottom and top of the tray but still the bread bottom got burnt. I baked at 200 degrees for 20 – 25 minutes as mentioned in the recipe. Please suggest how to avoid the bun getting burnt. Thank you. welcome ansuya. bake for less time as your oven has a high temperature range. just bake for 12-15 minutes and then check. Thanks Dassana for the suggestions. Today I tried again but this time the buns turned out hard. They are not soft. I followed the recipe as mentioned in your blog. If I take out before the time , there is no hollow sound at the bottom of the bun. Please suggest how to get soft buns. welcome ansuya. i think some issue with the yeast proofing. thats why the bread has not come out soft. if the dough is leavened well then you can actually hear the hollow sound. try to use good quality yeast. Hi Dassana – thanks for your bread recipes. This is the first time I am going to venture making breads at home and wanted to ask if a small normal otg (oven/toaster/grill) kind of oven would suffice. and also should i bake on the middle rack? welcome preeti. yes a small regular OTG is sufficient. bake on the middle rack. keep both the top and bottom heating elements on. i have a question. when you use whole wheat flour do you use the regular one or WHITE whole wheat flour? i heard that white whole wheat flour will make a lighter bread. woofyee, i live in india and the kind of whole wheat flour which we get here is made from hard durum wheat. this is the only flour we get locally. i have heard about white whole wheat flour and you can use that also. I really like the look of the breads! I have one question, in my country it’s really hard to get fresh herbs, isn’t 3/4 cups too much if I’m using dried herbs? Oh, and one more question, how many breads does this recipe make? P/s sorry for my poor grammar, english is not my native language. oops, its 3/4 cup of fresh herbs. i will make the changes. for dry herbs, you can just add about 1 tbsp a bit more. 4 breads is the yield. It’s only thanks to your wonderful bread recipes and encouragement that I got the confidence and courage to make this bread . The bread was really delicious ! Thanks a lot. One question… How do you store your baked bread and if stored in a fridge, what is the best way to warm the cold bread.??? thanks radhika. do try baking more different types of breads and you will get confident in bread baking. i wrap the bread in a foil or keep in an airtight box in the fridge. i sometimes preheat the oven and warm the bread or warm them in the microwave. otherwise if its a loaf, then i slice and warm the slices on the tava. hi ,your recipes r reallyfabulous.i really like thm vrymuch.thank u vry much fr ur eggless banana bread recipe.i hd the recipe bfr bt lost it and was searching fr this recipe,evn askd a lot of people bt no one could help me.suddnly i saw this recipe n tryd it in microve,n wow at last my search ended.urs is far more better thn th one i usd to make.thanks a ton.really overjoyd aftr trying it out.im just speechless n dnt knw hw to thnk u.i will b greatfull if u help me wth sm no onion n no garlic recipes.is th recipe of white bread n brown[atta]bread same.thanks a lot once again.u just made my day.all my family members lvd th eggless banana bread vry much. thanks a lot rima. you are welcome dear. the white bread recipe is made with maida or all purpose flour. 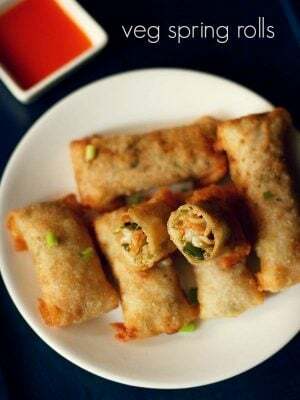 you can use this recipe with whole wheat flour too or half-half of both. usually stone milled atta absorbs a lot of water due to the presence of wheat germ. so you may have to add more water while kneading. i will post brown bread recipe soon. i really like ur recipes. Do keep sending the new ones. 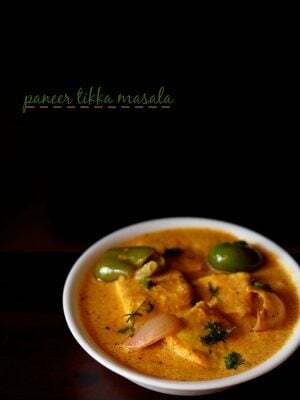 when i read ur recipes they really seem authentic & taste fabulous , lip smacking. I want to request u that please send me a recipe of eggless fluffy cake. I have tried many a time with milkmaid, curd ,pepsi but it never rises enough but i always get a cake soggy from inside. I never get a market like yummy cake. 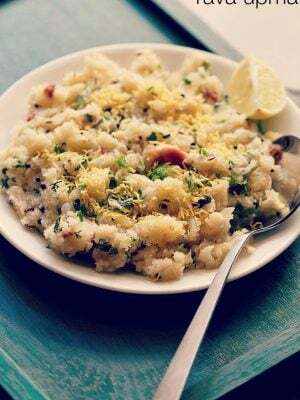 Please help me with ur recipe as mine is a pure vegetarian family they dont buy it from market as they believe that bakers do add egg in the cake. Pls! pls!pls! thanks dear. even i don’t buy cakes from out. i will post a good fluffy eggless cakes soon as i have got many requests for the same. Is there a microwave recipe for making bread ? there are microwave recipes for making bread. but i have not yet tried making breads in the microwave. I really like this recipe. It seems right up my alley! Yum. Too good Dassana, I will try this for sure, I haven’t tried on breads too much. Your clicks are looking stunningly good. hey anamika, do try making breads at home. you will get addicted to them. they are much much healthy and better than the store brought ones. Hi, just wanted to know if they can be made in advance ? Coz I have a potluck coming up and would want to wrap up all the baking at least one day before the event. 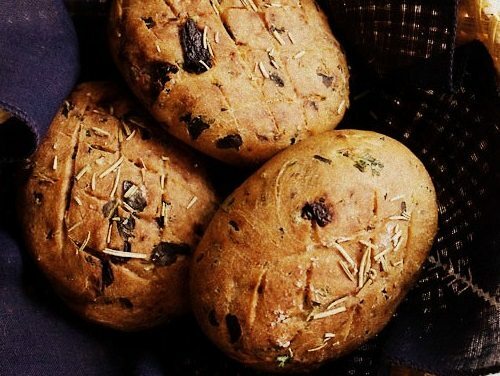 the herb bread can be made a day in advance. no issues here…. just keep them in a bread box in the refrigerator. you can keep them out too, but i always keep them in the refrigerator. How do you reheat the bread/buns once out of the fridge?in the microwave mode or the convection mode? for breads, i just slice them and warm them on the tava. 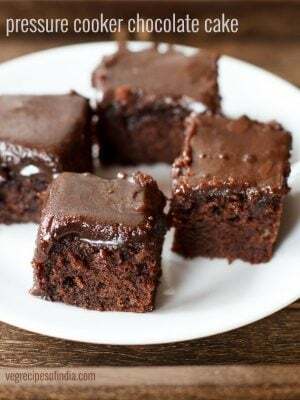 for cakes, i slice them and microwave for around 30-40 seconds. i rarely use the convection mode for reheating.